A nice short piece by Simon Winchester, which, if true, adds something to our knowledge around Paddy’s story in The Violins of Saint Jacques. The Violins of St Jacques, Patrick Leigh Fermor. I think this may be my favourite book in the world. I was asked to write the preface for the Oxford University paperback edition. 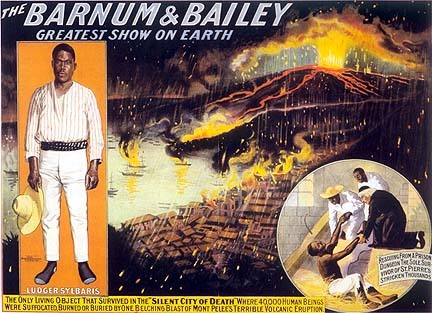 It’s about the eruption of Mt Pelée in 1902 on Martinique. It sent this thing, a glowing cloud, a nuée ardente, ash and lava and hot air rolling down the hillside. It completely devastated the town of St-Pierre and there was one survivor out of a population of 30,000. It was the worst volcanic disaster of the century, until the tsunami of 2005. Before that it was Krakatoa in 1883 when 40,000 people died, but most of those died from the tsunamis that followed the eruption. Tsunamis were detected all around the world after that eruption. Anyway, there was a ball being held in St-Pierre that night and, of course, everyone at the ball died, but the way it’s written is that he supposed all the guests survived and the party continued under the water. Fishermen say that a few miles out to sea when they are waiting for the fish they fancy they can hear music under the water. Louis-Auguste Cyparis. He was in prison and that’s what saved him, the only window was a narrow grating in the door. He was bad guy. A very violent man. I think he’d killed someone in a drunken fight. He went on to be a celebrity with Barnum and Bailey’s Circus. I love all Patrick Leigh Fermor’s books, but this is his sweetest. This entry was posted in The Violins of Saint-Jacques and tagged Louis-Auguste Cyparis, Martinique, Mt Pelée, Patrick Leigh Fermor, The Violins of Saint-Jacques on October 18, 2011 by proverbs6to10.